It’s been a weird old year and we’re only a month in. It’s a year defined by American politics, no doubt. Anyone that believes in the modernist idea of the inevitable march of progress has had that brutally checked by the election of a person that typifies so many horrible things about what’s in our nature. What was sown for many years by cynical politicians and an increasingly less diverse mainstream media, suffocating on its own business models, is now being reaped. I have felt more despair in the last month than I have in the previous 40 years. But then my daughter kicks a footy on Thebarton Oval. In the lead up to the Crows women’s first game they have a footy clinic for girls. I signed the lass up like a flash of course. At five she will be one of the first female footy natives – someone for whom women playing footy is not a novelty, with a local, state league and AFL team to follow and aspire to play for. Her older brother has his sporting career mapped out already: playing for Norwood, then the Crows with a move over to the Strikers / Australian cricket team when he is done with footy. The lass will be of the first girls to be able to invisage such a career for herself. I bloody love it – truth be told a fair amount more than her at this stage in proceedings. 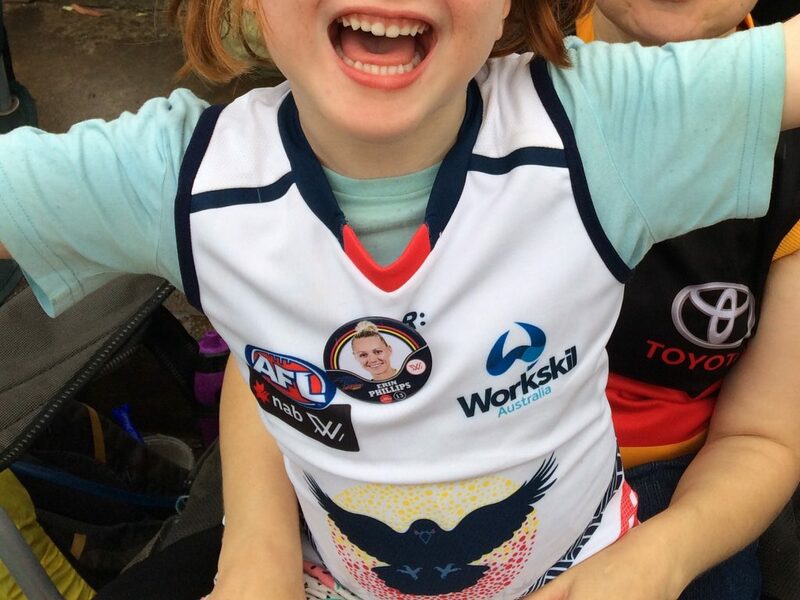 As she runs about on the ground doing a number of footy drills with 50-100 other girls (much to the chagrin of her brother), I’m out the back with teems more people queued up at the Crows’ merchandise van, seeking that first women’s guernsey (for the lass obviously, it wouldn’t flatter me at all). Badges are available and family members buy the entire run of of their daughter / sister / cousin’s badge. I get an Erin Phillips and Heather Anderson for the kids – Tayla Thorn is already sold out. Nigel Smart nips in through a side door and grabs himself a tie to whack on – everyone has been caught by surprise by the response today, clearly. We make our way to our seats on the fence of the south western flank and the teams run out to generous and then rapturous applause in that order. The family theme of the day continues as it turns out GWS’s Alex Saundry’s family is sitting just down from us and Tayla Thorn’s family can be seen holding a sign bearing hands and her name. As the match starts so does the light rain that just refuses to go away. No-one seems to mind too much as the ground reaches comfortable capacity (the record is 20,800 in the 1960s, a scary thought). The match gets underway and GWS have the better of the early play. They get the ball out of the midfield and muscle it down the ground. Despite five minutes of dominance they can only manage a point before the Crows run and gun, flying the ball from the kick in down the grandstand wing, leading to a Gibson goal, skidding the ball through from 50. Happiness abounds. From that point until the last quarter the Crows have complete control of the match. Erin Phillips shows off her footballing pedigree with an exceptional set of hands, good awareness and some kicking on goal will come good (nonetheless bagging three), Chelsea Randall oozes class around the ground and is an excellent user of the ball. Ebony Marinoff gets plenty of it and applies plenty of defensive pressure to boot. Sidestepping, crash bashing Sarah ‘Tex’ Perkins is immediately a crowd favourite and a great story too; one of many. Post match she runs past giving out high fives. The lad is left shaking a sore hand. GWS works hard but lack the Crows’ system and class in disposal. Jess Dal Pos and Nicola Barr put in particularly when not in possession as balls slip through hands. When McWilliams bags their first goal in the last quarter it is a cause for celebration even if the match is long gone. As the final siren goes, the result, again, is happily received – a laid back, inclusive crowd stays to watch the team belt out the club song. Mildly moist, they file out. Women’s footy has had a successful start and the suburban ground has provided the perfect backdrop for the most light-hearted, joyful (outside a Grand Final) footy crowd I have ever been in; even if a bit light on for facilities. Plus, it’s great to have the Crows back as South Australia’s (and the Northern Territory’s) team, if only for a few seasons. We hang around long enough to have a kick on the ground. Mother kicks to daughter. Wonderful stuff – we’ll be back. Dave you have highlighted superbly what is great about women’s footy.I wish to bring up worrying points re will its popularity and current exposure result in lost sponsorship at SANFL level and will the bloody Afl actually realise or even more likely not notice or care and heaven forbid even help the 2nd tier competition ? Bloody love it too, Dave. The foundation of elite women’s football and cricket leagues will prove to have a transformative effect on young girls who have gravitated to these sports. They can now dream the same way as boys and we live in a better world for it. Bloody loved the piece, too. Dave, Sounds like you had as much fun as I did Friday night. Rulebook, you already know the answer to that one. The AFL doesn’t care about second tier comps. Nailed it Dave. Just feels so right in a political soup of not right ATM. great report, the great feeling you write about was at every game. Half the population now feel empowered through seeing women out there doing what they love, and the other half, well, there are heaps of Daves and Johns and Petes out there too. There are always going to be challenges and we always have to speak our mind, but this weekend was a time to celebrate something special. AND the AFL got this right. There will always be teething problems but women’s footy has proved to be a salve for our souls. You pick up very nicely on the family feel of it all. Most of us non South Australians won’t be familiar with Thebarton Oval, is the 9+k that were there basically a full house? Thanks for taking the time to read and the comments all. Rulebook, take your point but that is something state league footy will need to deal with. Worthwhile noting the Crows’ sponsors (Workskil, Harris Scarfe, COAR) appear to be new to footy sponsorship rather than diluting the pool. The issues facing state league footy are larger than the potential impact of AFLW for mine. It felt very salve-y Yvette. The only thing the AFL has got wrong thus far is only considering Melbourne venues for the Grand Final. That jumper is a cracker. Has she taken it off yet? Loved your tweets on the day too. ‘played Dave and family. Looked like fun and your report confirms this. We hope to get along in the next few weeks and I hope they keep the games at Thebby. On a related issues I still can’t understand why the recent Shield match held down at the Bay was scheduled from Wednesday to Saturday. If the game is being taken to the people why wouldn’t you run it Thursday through Sunday? Another extra-terrestrial decision by Cricket Australia. Gee, Perkins is a beautiful kick of the footy! Thanks Swish, it’s a great guernsey. Finally managed to get it in the wash on Monday morning. If school didn’t have a uniform she’d probably still be wearing it. Yeah, Thebby was a good venue Mickey providing they have another bar running next time. The last Adelaide based home game is at the Parade on 4 March which I am very much looking forward to. Redlegs play the Bays in the SANFL Women’s comp at 3.40 followed by Crows / Lions at 6.40. Should be a cracker. I think CA has long stopped caring whether people watch shield matches. Thanks Dave, l’m only now catching up on more reports from the weekend. What a weekend. I love that the comp is national – I reckon the SA/NT combo is (respectfully) deadly. I hope the GWS Giants go well too. I look forward to more Crows reports from you. Tonight’s game against Bulldogs should be a cracker!